Happy Tuesday, all! 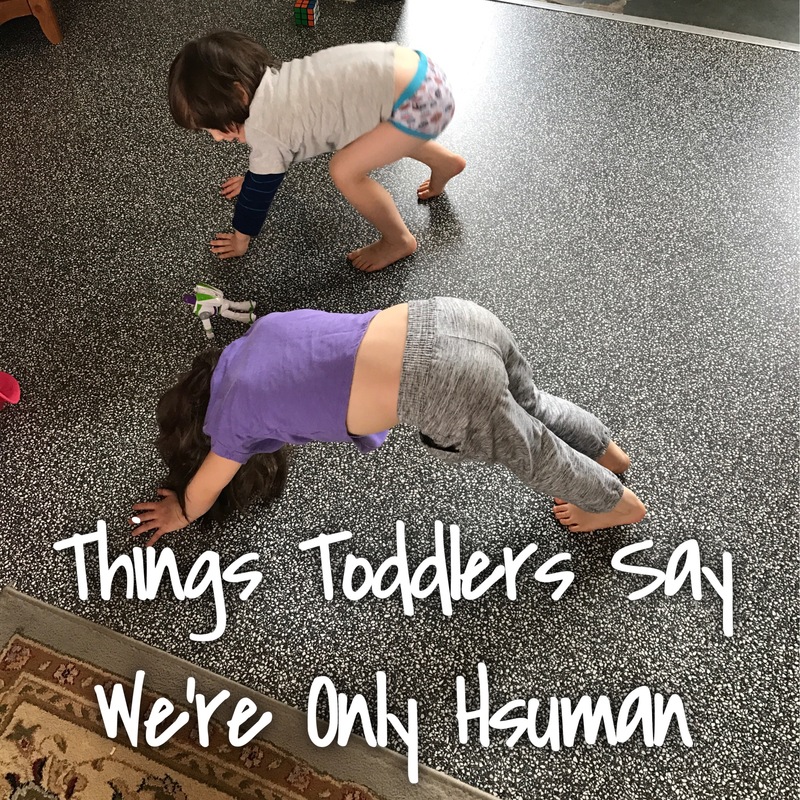 Besides the adorable yoga photo, there are some other funnies here to brighten your day. Enjoy! Necie: You have on shoes but no pants? J: Yeah. Like EK did it. I did what she did. Me: Are you upset, bud? J: I’m just mad at everybody. EK: That means you’re mad at me! J: Not a funny joke! Necie: Yes you are… I can see it. EK: I was just frownding. J: Can you get me more card moneys? 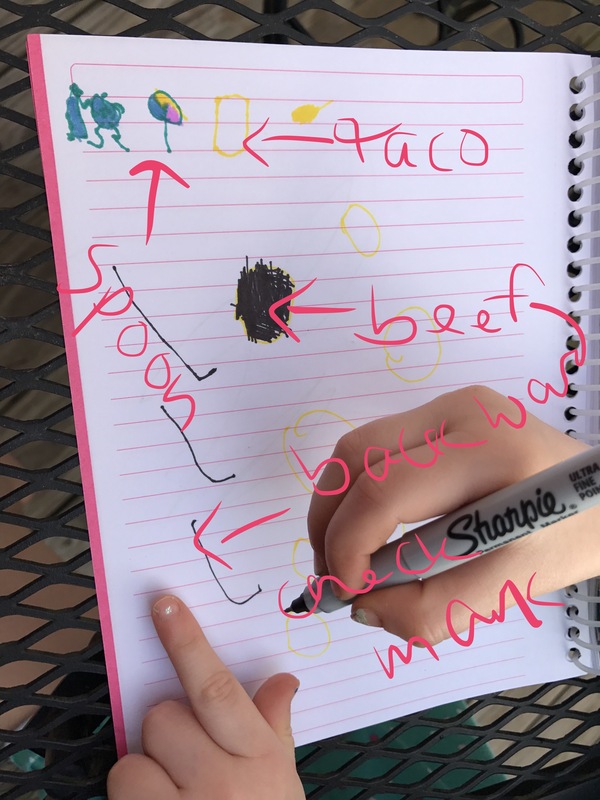 EK is working on her drawing skills. EK: I want to listen to Moana. Me: Well, I put on the Disney radio, so whatever comes up is what we’ll hear. EK, making her justification: It’s cloudy enough. We can listen to Moana. J finishes his breakfast in record time. Me: Wow! Would you like some more eggs? J, grunting and trying to pick up D: Here, Mom! Here’s the biggest boy you never haved before! D has some new words, too! 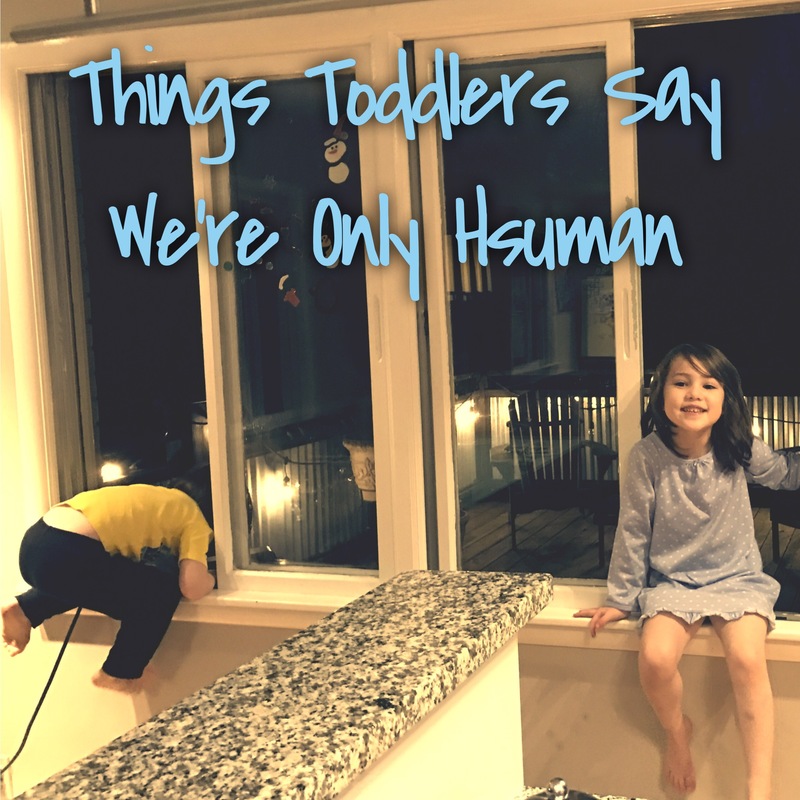 Here they are: no, bye bye, G-dah (what he’s calling my dad), Neenee (what he calls my mom AND hubby’s mom), night night, water, shoes, pants, nose, go (because he loves going wherever J and EK go), down (doesn’t like the high chair if he’s eaten what he considers to be enough) and yeaahhhh! And did I mention “no”? He says that one most of all. Who else’s kids love saying no to everything? Will it ever stop?! Evangelism is something that used to scare me. In my youth, to me it meant that we would go around handing out gospel tracks, or randomly starting conversations with people, so that we could pray with them, hoping to lead them to Jesus. 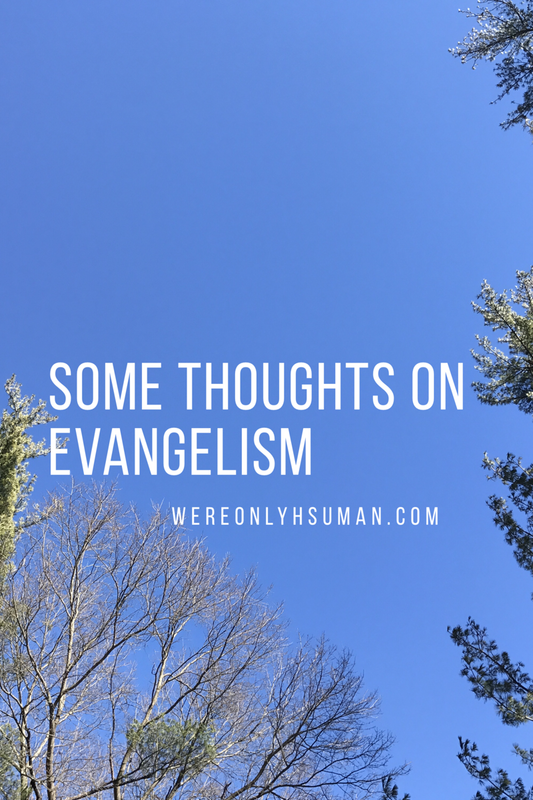 It had less to do with fostering a love of Jesus or a desire to worship him, and more of a way to get another tick on our evangelist’s counter. As you might imagine, this didn’t work very well for me. As an adult, the word still scares me a little bit, because I don’t quite know how to put my feelings into words. The scars are still there from my misinterpretations as a youth. But there is so much hope, for me and for you, to be able to overcome the scars of myself and others, and continue on into the love of Jesus in a true sense, and then share it with the world. Well, I have to begin by saying that the psalmist surely stirred up some excitement and laid a healthy burden on me to share more of the Gospel. Our mouths should tell of His righteous acts and deeds of salvation! We should proclaim His wondrous deeds and His might! It not only encourages our brothers and sisters in Christ, and not only spreads the truth of the Gospel to all ears, but it fosters our believing but sometimes wayward hearts by proclaiming and declaring what we know to be true. Let’s talk for a moment about “proclaim” and “declare”. As a worship leader, sometimes I am moved during a song to encourage the congregation to proclaim or declare some of the lyrics we’re singing. There’s a slight difference between those words, and so it’s important to do both, sometimes. To proclaim is to announce something openly, publicly, and officially. To declare is to solemnly and emphatically say something. Another definition even says to reveal one’s intentions or identity. To proclaim the righteousness of fearsome and loving God, and the salvation attainable through Christ Jesus are things that should be proclaimed, shouted from the pulpits, platforms, and rooftops. To declare that death has been defeated, and that we are made new in Christ is a truth that can reveal our identity, and alter our intentions. So as I read those verses of Psalm 71, and then read them again, and then prayed them then and there over my life and my vocation, I was convicted. I was reminded that we, as followers of Jesus, are called to live by his example, which was indeed proclaiming God’s righteousness and mighty acts, proclaiming His wondrous deeds to every generation and all those to come. In one of the books I’m reading (Lioness Arising. Lisa Bevere. Find it. Buy it. Devour it as I have done.) she encourages us to use our circles of influence to share God’s truths and Jesus’s words. While I’m on the platform, every Sunday, worshiping the Lord, and hopefully bringing everyone in that journey alongside me, I have even more opportunity than I allow myself (or at least remember that I have) to actually speak Scripture and truth into the congregation. 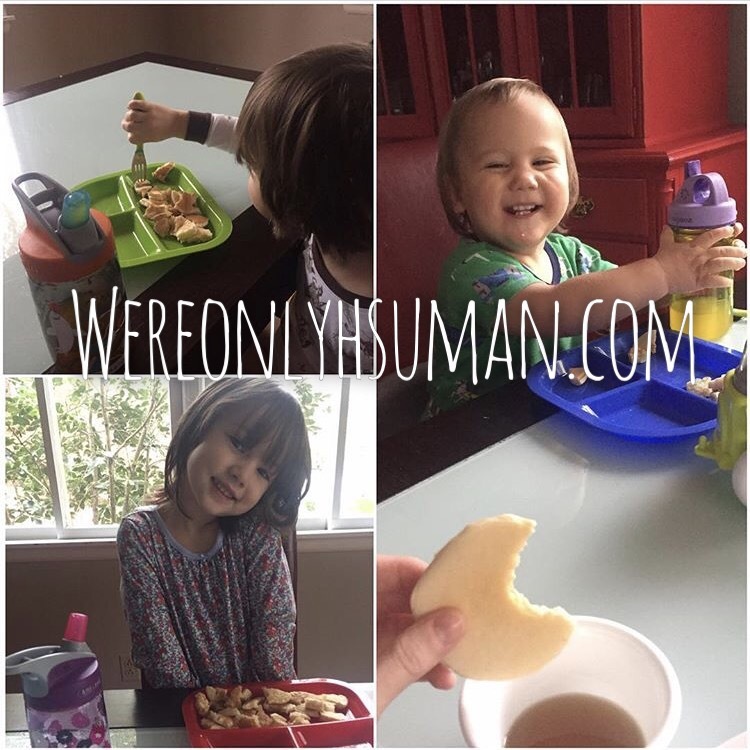 I have this very site where I share funny quips from my kids and what we ate for dinner last week, but I shouldn’t neglect the possibilities this site provides for the sharing of God’s Word. I have family members, friends, acquaintances, and sometimes strangers that I can come alongside and encourage, pray for/with, and speak truth into. Why should I be scared of being an evangelist? Why should I be nervous to do what Jesus did? When you’re about to get REAL serious about running. Well, I’ve done it. I’ve signed up for a fitness challenge and I can’t decide whether I’m so excited I could jump out of my skin, or I’m so nervous I could… um… have to run to the bathroom. Like I’ll be doing in the middle of every workout because CHILDBIRTH KILLS BLADDERS. Now that that’s out of the way, let me tell you about where I am right now in my fitness journey. When I decided to train, I had been running 3-4 miles 3-4 times a week, plus at least one other weight-based workout per week, and probably some yoga. That was a little less than a month ago. 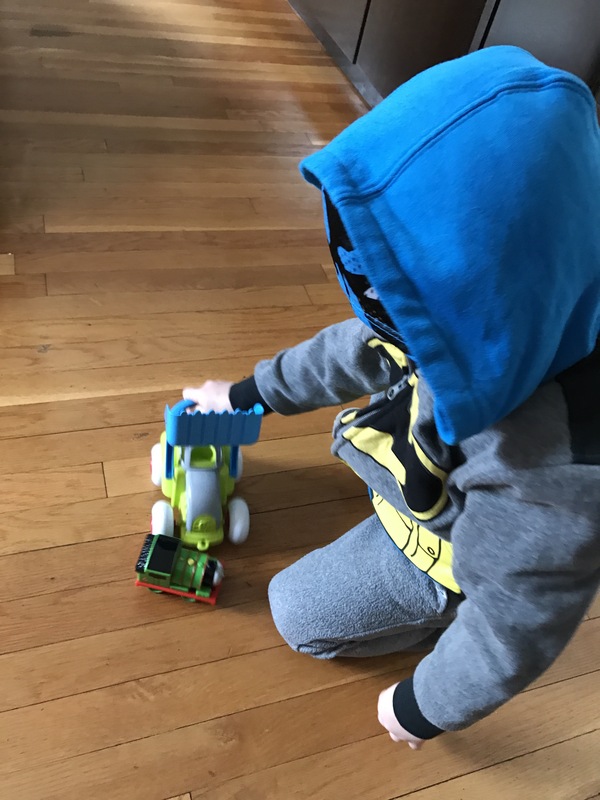 During this month that I’ve thought about really getting my game on and running until my legs fall off, I started back up talking to a running friend of mine, who coincidentally leads a mom’s fitness group here in town called Stroller Strength (here’s the link if you’re local!). Melissa is amazing, encouraging and inspiring, and when I realized it was challenge time (I’ve done three of these babies before) I jumped out of my skin with excitement and anticipation. 1. Friends. I realized that some friends I’d made during my stints with SS in the past were still going, and I’ve already met some new gals I’m excited to get to know. It’s always more fun when you’re not alone, and accountability makes a HUGE difference when you’ve set a fitness goal you’re trying to actually achieve. Melissa also puts us on goal-based teams, so naturally I’m on a running team, and I’m psyched. 2. Food/Exercise/Water/Rest Log. This baby is DETAILED, and we check up on each other’s logs throughout the 9-week challenge. We also have clean eating weeks (cutting out all processed foods) where we cut even more crap out of our diets for a week at a time. It’s magical (and so hard). 3. Extra workouts. This is everything from regular SS class (boot-camp style weights workout), “fun run” together, yoga, Sculpt class (for toning) and running my booty off on my own time until I achieve my goals. When I’m mid-challenge, I shoot for a workout of some sort every day, even if it’s short, even if it’s not strenuous. Get moving, burn calories and build muscle. Every. Single. Day. 4. Meticulous scheduling. I don’t usually work out at the same time every day. I don’t even work out on the same days a week. But this time, I’ve got a few more things going on if I want to make it to lots of classes and get my miles in. Obviously, the farther I run, the longer it takes, so I have to plan longer and longer into my schedule the farther I am able to go. Also, one of the classes is on a morning that I work, so I have committed to making it to the other two classes a week EVERY WEEK to make the most of them. Perk: I can bring the kids to class if I need to. Best thing about SS, ever. I’m gonna have to start sleeping in my workout clothes to save time. 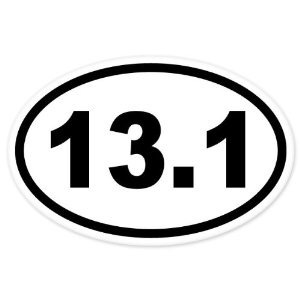 Goal (9 weeks from now): Register for and run (read: survive) a half marathon. 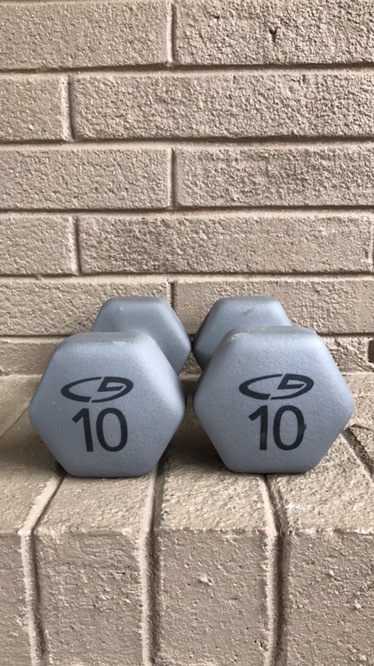 I will be adding a little bit about upper body strength to this, because that’s a separate goal that won’t necessarily just come alongside my runner’s training. For the past couple of months, my “goals” when I go out to run are to make sure every single mile is under 10 minutes, and to make sure my first two miles are under 9:30 or so. Those are loose goals, and I don’t always keep to them. But today at our baseline weigh-ins/stat recording, my timed mile was 8:31 and my 400m “sprint” was 1:39. I already started faster than I thought I would, but I think that has to do with being on an actual track. I typically run in my neighborhood, which is hilly, so my miles aren’t as accurate. I’m going to have to adjust my perspective on timing when I’m running on a track, apparently. 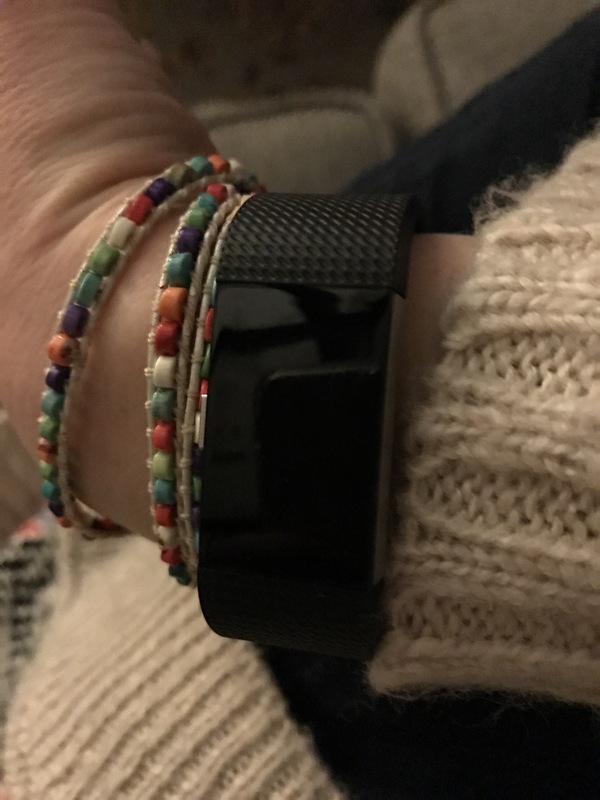 In other semi-related news, today while grocery shopping at Costco, I happened upon ONE LAST FITBIT Charge 2 in my size. It was destiny. I’ve been looking at those, Garmin running watches, and the Apple Watch, and just hadn’t decided what to get until today. So now that I’ve got a tool to use, I’m going to get used to it (and get it used to me) and be obsessed with it for the next nine weeks at LEAST. You’re welcome. SO! Now that you’ve gotten a complete update on how I’m working on my fitness (cue the song that will be in your head all day) you can say you’re keeping me accountable. Is anyone else working on their fitness? Tell me your goals! Tell me your process! I’m open to suggestions and can’t wait to hear if you’re committed to a health goal, also! Happy Tuesday, friends! I’m happy to bring a little humor to your social media and inboxes this week, just like I try to do every Tuesday. Enjoy the silly things my kids are saying these days! J: Pwaw Pwatrol is my fwavorite. EK: Now, you spank me, Mom! Okay? Carefully! EK, holding an old school egg timer to her mouth: Set timer for five minutes. Me: I don’t think that thing works exactly like Siri does. J, misinterpreting things: Ha! He called hisself stupid! 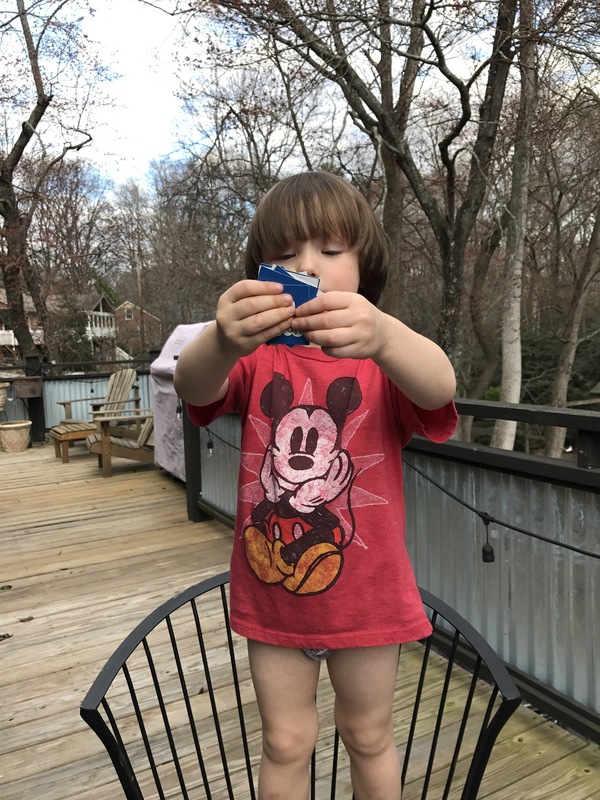 Actual picture of my son “sharpening his weapons”. 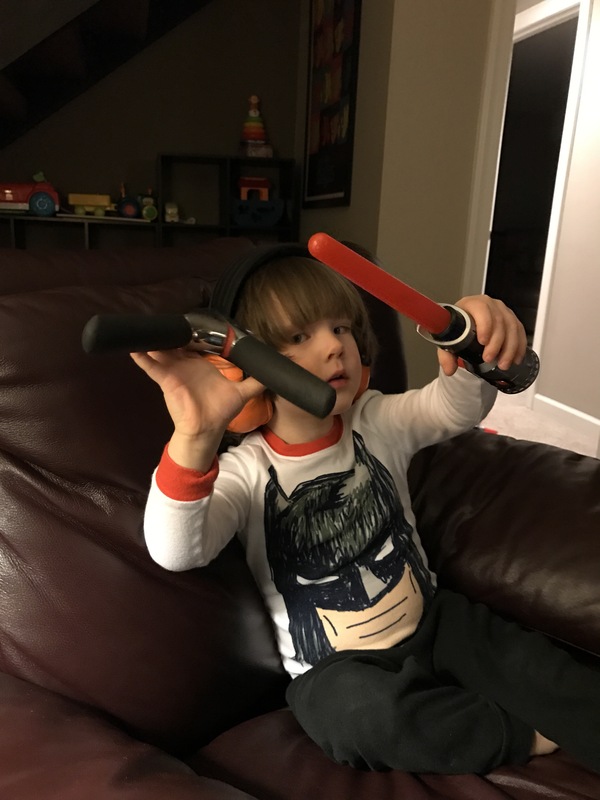 Yes, one is a garlic press, and the other is a partial light saber. And yes, he’s wearing his dad’s yard work ear muffs. J hears me whistling and says: I love it when you sing like that, mama. EK: I was dreaming about this song last night! EK, holding a yard weed: Daddy, what’s the name of these flowers? Hubby: I don’t know the name. EK: Why don’t you smell them? That might give you the name! J, running up to me as I’m holding my friend’s baby: Boop! (Gently taps baby’s nose) I just booped her nose, Mom! EK, one finger in her mouth: Mom, when we get home, can I have one of those things that gets the meat out of your teeth? Me: A flosser, you mean? EK: Yeah. This burger is stuck. EK opens up her Chick-fil-A chicken minis: Mom! (Hand over her heart) I missed these guys!! What have your kids been saying these days? 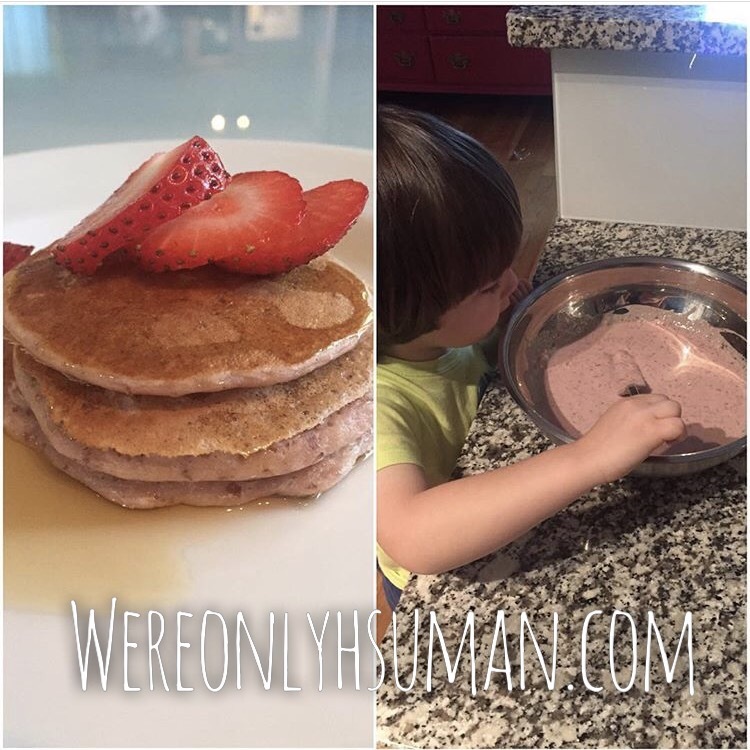 I make hot breakfast for my kids almost every single morning. There are very few exceptions – mostly because I set a particular precedent and now they won’t eat cold cereal. Talk about shooting yourself in the foot. Anyway, because of this fact, I’ve gotten really creative with the breakfasts I make, specifically in the pancake department. I found that I could hide almost anything in a pancake, in a good way. I make a new-fangled pancake batter with some crazy ingredients, I scramble a couple of eggs to go with them, and serve a side of fruit. BOOM! Healthy breakfast, please and thank you. If you want to know my pancake secrets, here are a few suggestions. Start with Bisquick (or whatever type pancake mix you prefer). I like Bisquick because it doesn’t have a ton of sugar in it to begin with, but it’s a good base so you don’t have to add things like baking powder or salt. I typically include the ingredients it suggests for pancake-making (a couple of eggs and some milk), then I flavor it with whatever mood I’m in that day. Add in vanilla extract. I ALWAYS dribble in some vanilla extract to the batter. No excuses not to. I make my own (well, my mom makes it, but I help!) so it’s extra special, but if you’re not a creative guru like my mama, regular vanilla will do. Get some fruit. Usually, I opt for whatever is overripe/soft/abounding/neglected in our kitchen. Banana works well, but we also like blueberry and strawberry, or a combination of those. Mash it or puree it, and stir it in. Do it before the milk, because it often means you need less milk, because it’s juicy. Grab some flaxseed. Or chia seed. 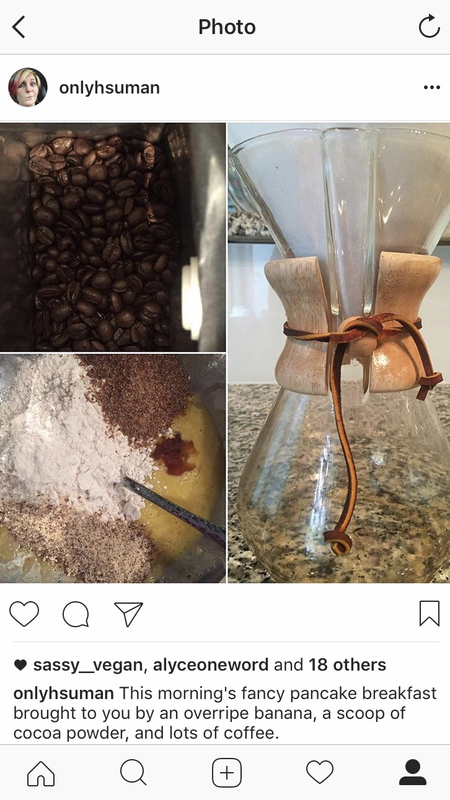 Or almond flour. Or whatever power powder you have around. Even ginger or turmeric could hide if you have a careful hand. You can likely sprinkle in a couple of tablespoons of the powders (or a teaspoon or two of the spices) without it getting noticed by kids or husbands. Mix in some peanut butter or cocoa powder for a new spin on flavored pancakes. Peanut butter adds protein, of course, and makes them wonderfully thick and fluffy. Cocoa powder gives them a chocolatey tone without a ton of sugar… although I find that you need to add a little sugar (if you’re using Bisquick especially), honey, or other sweetener to combat the slight bitterness. I typically go for coconut sugar. Shape them like Mickey Mouse, snowmen, or caterpillars if you’re feeling fancy, and top them with some pure maple syrup. More flavor than “pancake syrup” (sorry, Aunt Jemima) and no artificial ingredients! 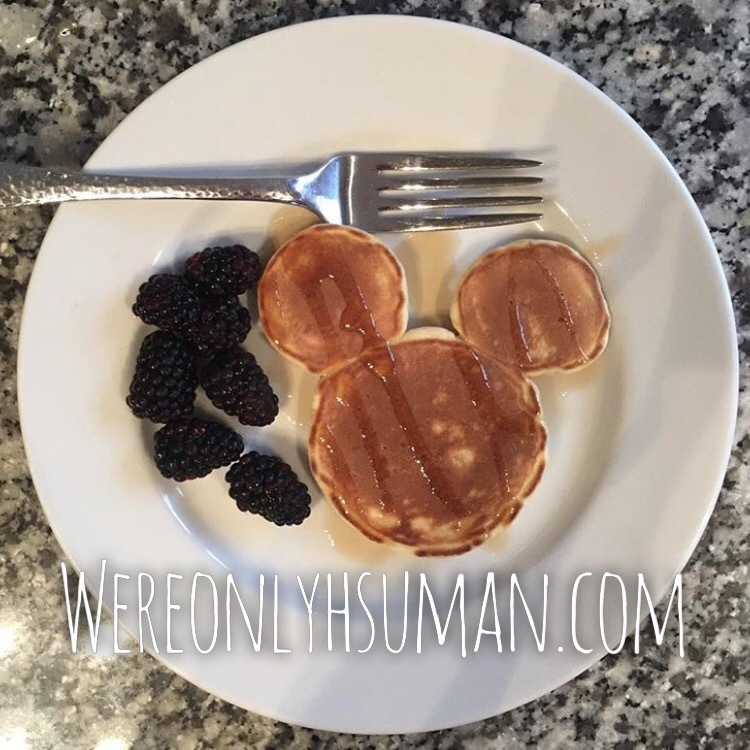 In case you’re wondering, this is just another post about my love affair with breakfast food. Valentine’s Day can be a tough time to get good dinner reservations, and it can be an expensive flowers-and-chocolates gift day. If you’re looking for something non-traditional, or something that won’t break the bank, try these ideas for a fun date night! 1. Breakfast for Dinner. Whip up some heart-shaped pancakes, and top them with whipped cream and strawberries (if you core them, then slice them, those can be heart-shaped too), make some hot cocoa (maybe with a little raspberry liqueur if you’re feeling fancy) and enjoy it by candlelight. It’s basically a meal and dessert at the same time! 2. Backyard Star-Gazing. What could be more romantic than snuggling on a blanket in the back yard, looking at the stars? If you like to know what you’re looking at, Sky View is a neat app where you can hold it up and actually read the labels for the stars you’re seeing. 3. Have a Game Night. Whether you like playing cards, or you prefer board games, it can be fun to just chat and play games together. Fun and easy games that can be played by just two include Rummy, Speed, or Crazy Eights (card games), Phase 10 (a card game of its own), Dominos (we like the Mexican Train version! ), Quiddler or Perquacky (word games) or the game of Set (this can be a solitaire game, too). Most of these can be found at Wal-Mart, Target, or on Amazon.com! 4. Reimagine a favorite date you’ve been on before. Have you had a history of wonderful dates together with your sweetie? Take an old idea, and revamp it! Cook the meal you shared at home instead of going out for it. Watch the first movie you went out to see together on DVD on your own couch. Make those fancy cocktails at home. Even if the location isn’t the same, the revisiting of a treasured memory can still be fun. If you have kids now, make it a kid-friendly experience, while sharing a little of your history with them! What are some inexpensive dates that you’ve enjoyed with your love? Happy Tuesday, and happy Valentine’s Day! My kids have been obssessed with the topic of Valentines’s Day, despite my efforts to not make a huge deal out of it (since Hubby and I don’t really do much). Either way, there’s always a party at school, so there’s no avoiding it. SO! A little humor for your Valentine’s Day, since who doesn’t love the funnies?! J: He gotted me so well. He was trying to caught me and he caught me! He tried to gobble me up and swallow me down into his froat. But I’m too big for him to swallow. EK: My mom told me I couldn’t pee in the sink. EK: Well, Jesus is gonna make more of them so we can see them alive. I hear cheering from the other room..
EK: Yay, D! Wanna do it again? I come in and see her putting together a puzzle and giving him the credit. EK: I know what grasshoppers drink. They drink blood. My dad told me. Me: Do you mean mosquitos? EK: Oh yeah. I have short term memory loss. EK: I’m going to be the mom ok? *Crosses her arms and runs off shouting* Oh no, the baby! Oh no, the baby! 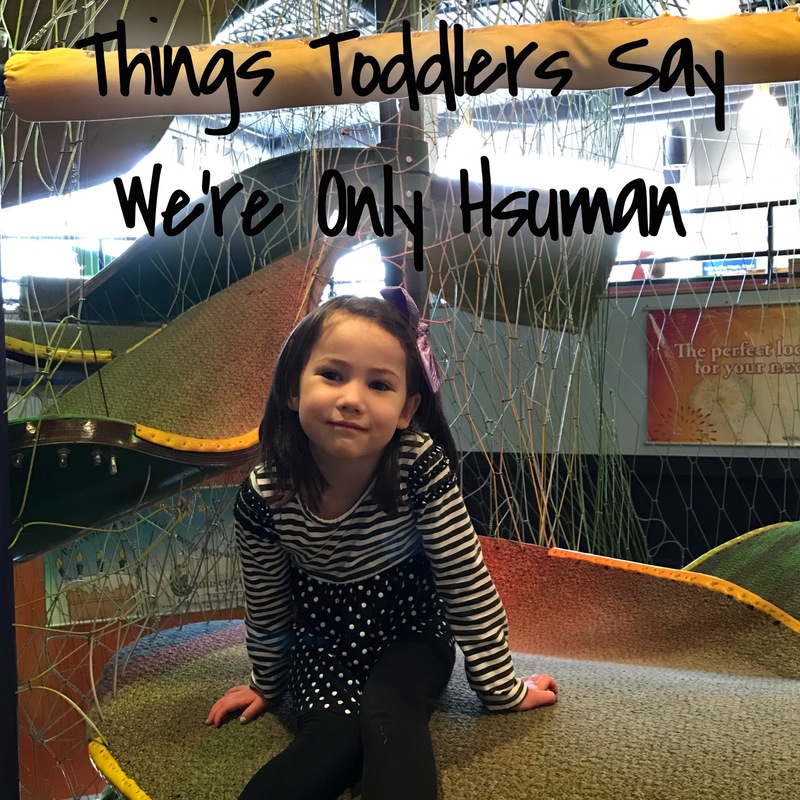 What funny things have your kids said recently? ?